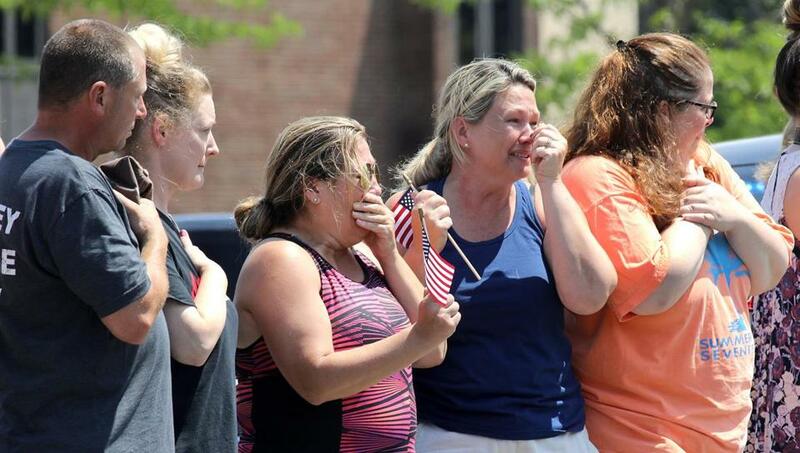 Mourners stood along Main Street in Weymouth as a procession carrying the body of officer Michael Chesna passed by Sunday. WEYMOUTH — A police officer and a local woman were shot and killed in a quiet residential neighborhood Sunday morning after a 20-year-old man allegedly crashed a car, attacked the officer, stole his gun, and used it to shoot both victims, according to the Norfolk district attorney’s office. 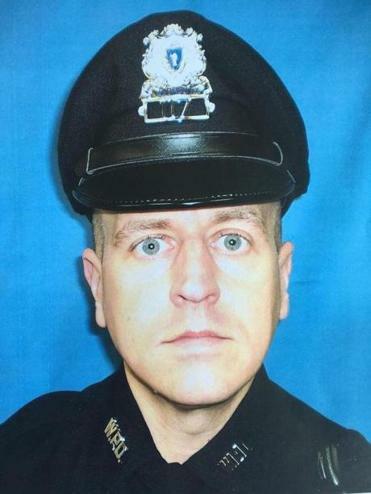 Weymouth Officer Michael Chesna, 42, died in the line of duty, and a nearby resident was shot and killed in her home, allegedly by Emanuel “Manny” Lopes, 20, officials said. Lopes is in custody and is expected to be arraigned Monday on two counts of murder, authorities said. 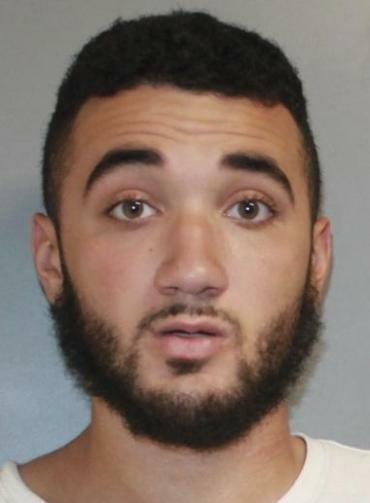 A 2017 booking photo of Emanuel Lopes. 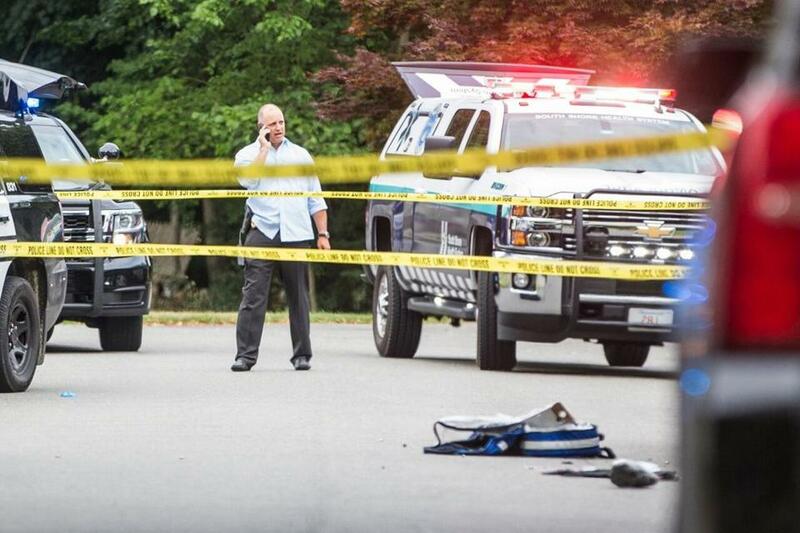 About 7:30 on Sunday morning, Weymouth police responded to a report of an erratic driver near South Shore Hospital, Norfolk Assistant District Attorney Greg Connor said in a news conference Sunday at Weymouth police headquarters. 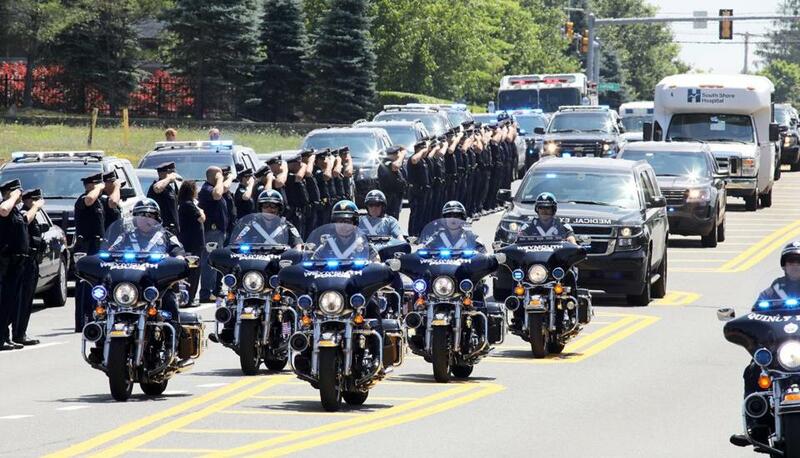 Fellow officers and mourners paid their respects to Weymouth’s Michael Chesna. Chesna, who was due to end his shift at 8 a.m., arrived to find a BMW sedan involved in a single-car crash, from which the alleged driver, Lopes, had fled on foot, officials said. Chesna found Lopes allegedly throwing rocks at a home on Burton Terrace near its intersection with Torrey Street, according to a law enforcement official briefed on the case. The officer “exited his vehicle; he drew his firearm and commanded this man to stop,” Connor said. Lopes allegedly attacked Chesna and struck him in the head with a large rock, officials said. Chesna fell to the ground and may have been unconscious, as Lopes allegedly took the officer’s gun and shot Chesna four times in the head and torso, according to officials. Another officer arrived and saw Lopes allegedly standing over Chesna with a gun. The officer fired his gun through the windshield of his police cruiser, striking Lopes at least once in the lower leg, officials said. Lopes allegedly fled on foot, still holding Chesna’s gun, Connor said. “During the foot chase through the yards of Burton Terrace, it is believed Mr. Lopes discharged Officer Chesna’s firearm an additional three times, striking a local resident in her home” and killing her, Connor said. Lopes was captured soon after he fired the shots, officials said. Chesna and Lopes were both taken to South Shore Hospital. Connor said it was unclear Sunday whether Lopes would be arraigned in court or at the hospital. Investigators have not released the second victim’s name. Around the corner from the scene of Chesna’s shooting, a black vehicle from the Office of the State medical Examiner pulled into the driveway of a Torrey Street home, where bullet holes were visible in a window, shortly before 4 p.m. Sunday. About 4:15 p.m., officials could be seen leaving the white 2½-story house carrying a black body bag on a stretcher. Bullet holes could be seen in the sliding glass door of a nearby home. Chesna was an Army veteran who had served in the Middle East, a husband, and father of two. Chesna’s father-in-law, Francis Doran, 78, of Marshfield, said he is worried for Chesna’s two young children, who are left without a father. Doran also spoke of his anger over the slaying. Weymouth police Chief Richard C. Grimes, who hired Chesna, praised his attitude toward his work at the news conference. On Sunday afternoon, area residents visited Weymouth police headquarters to leave bouquets of flowers or offer their condolences to officers. Outside, police, firefighters, and town workers began erecting black bunting over the building’s entrance. By Sunday evening, the flags at the police station were hung at half-mast as the memorial grew. A memorial surrounded the Weymouth police station’s sign Sunday night. Lopes was known to Weymouth police, authorities said. He was arrested in September 2017 for vandalism at a Weymouth dry cleaners, according to a police blotter post . In that arrest, Lopes also attempted to flee police, running into a wooded area where he had to be found by a police dog, the Patriot-Ledger reported. A woman at a Brockton address listed for Lopes in the police blotter declined to comment on the case Sunday afternoon. 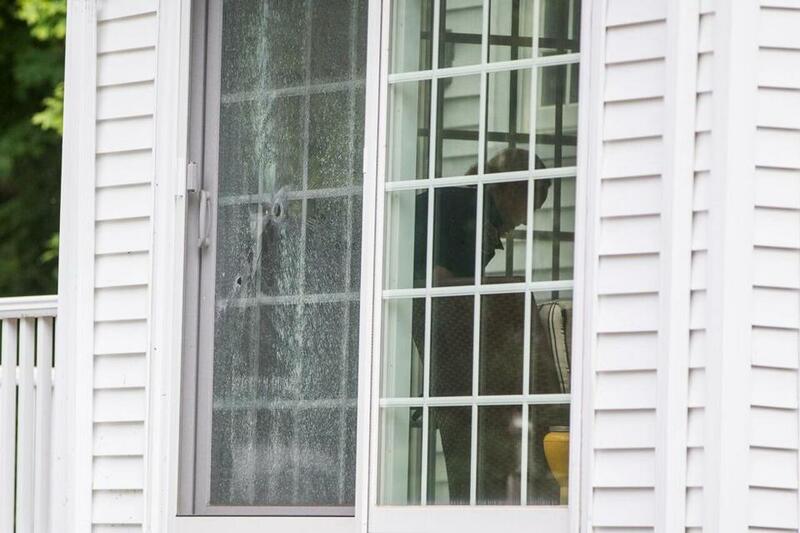 The shootings rocked a suburban neighborhood on an otherwise quiet Sunday morning. Resident April Visco, 43, said she heard a rapid succession of 10 to 20 shots about 7:30 a.m. and ran outside her house to see what happened. She heard someone yell three times, “Get on the ground,” she said. Several marked and unmarked police cruisers appeared on the scene within moments, she said, and she saw a man being placed into a police cruiser about 20 minutes later. After police arrived, Visco saw several officers crying and hugging one another, she said. Police in Weymouth saluted along Main Street as the body of officer Michael Chesna was brought to the medical examiner’s office in Boston. Torrey Street resident Tobias Macey said he “heard multiple shots” and a lot of yelling Sunday morning. All day Sunday, police — including uniformed Weymouth and Braintree officers, State Police troopers, Plymouth County sheriff’s deputies, and members of other agencies — cordoned off a large stretch of Torrey Street from Park Avenue past the intersection with Burton Terrace. Further up Burton Terrace, officers, including a K9 unit, could be seen investigating outside a home. Aerial drones hovered overhead. A white BMW sedan was taken from the scene on a flatbed truck and brought to South Shore Hospital, where it sat through the early afternoon at the intersection of Main and Columbian streets. Columbian Street was cordoned off by yellow police tape, while State Police and a Quincy police cruiser blocked access to the street, which leads to the hospital’s emergency department. A somber procession of vehicles from area police departments and from the Office of the State Medical Examiner left South Shore Hospital shortly after 1:30 p.m. and drove north on Main Street toward Route 3. Officers from multiple departments lined the street and saluted as Chesna’s body passed. The body arrived about 2 p.m. at the Office of the Chief Medical Examiner headquarters in Boston’s South End, where police officers and other emergency personnel again saluted as the procession made its way down Albany Street. Boston police Superintendent-in-Chief William Gross told reporters that the procession was a sign of respect for the officer. Jeremy C. Fox can be reached at jeremy.fox@globe.com. Follow him on Twitter @jeremycfox. John Hilliard can be reached at john.hilliard@globe.com.